Firefly media server is the one I know which serves music to my Pinnacle Soundbridge M1001, actually two of them. The version which is included in the synology doesn't seem to work. Might be that the compatibility list is only for the Roku version and not for the Pinnacle version. There is a difference and hence the need for the newer version of the firefly server which supports the Roku Control Protocol for the SoundBridge the excerpt below is from the wikipedia. Outside the United States, SoundBridge models are manufactured and sold by Pinnacle, under license from Roku. 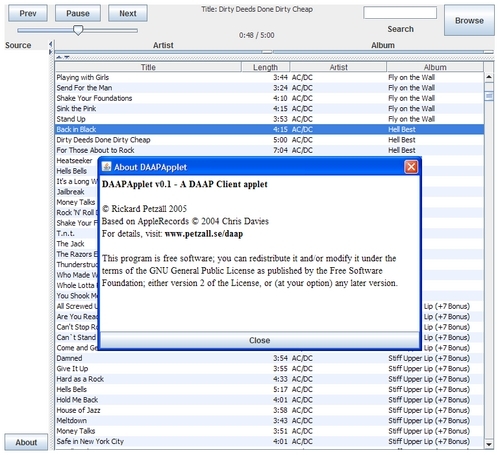 Although some Pinnacle models are similar or identical in hardware, Pinnacle does not have a license for the DAAP protocol, so Pinnacle models cannot connect directly to iTunes. 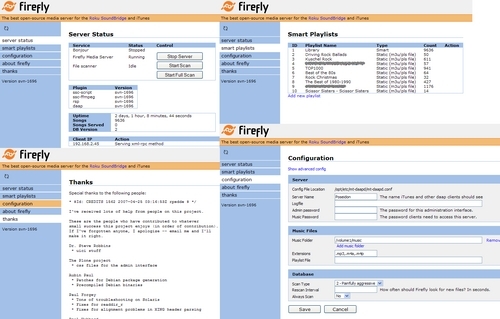 Pinnacle and Roku promote the Firefly Media Server as an alternative that offers similar functionality. mt-daapd - 0.2.4.2-1 - A multi-threaded DAAP server for Linux and other POSIX type systems. mt-daapd-svn - 1696-1 - A multi-threaded DAAP server for Linux and other POSIX type systems. Press i and use the copy/paste to insert the new start/stop script. Change the attributes chmod 0755 the /opt/etc/init.d/S60mt-daapd so it is possible to run the script. It will be run automagically by the rc.optware script at every startup. It will run as user nobody. Create the directory for the default scripts if it doesn't already exist with mkdir /opt/etc/default and the default script itself echo "RUNDAAP=yes" > /opt/etc/default/S60mt-daapd. If you ever replace the yes in the /opt/etc/default/S60mt-daapd file it will stop starting the mt-daapd. You have to configure the mt-daapd prior to first running it by modifying the /opt/etc/mt-daapd/mt-daapd.conf file. Basically you have only to set the location of the mp3 files. On the ds106 this is expected to be /volume1/music. I have also changed the server name and the password to access the web gui. There is no password to protect the mp3 music but you can configure it later using the webgui. Again just copy/paste the config below. # Not that the -d <level> switch will control the log verbosity. When you start the soundbridge it should find the firefly server. You can use a ssh tunnel to forward the port 3689 anywhere in the world, if your ds106 is accessible by ssh from the outside. It is then possible to play your music at work, friends, foes, wherever using just the browser. To play your music for example through the Wii console you can use a flash based player. This has to be installed additionally. 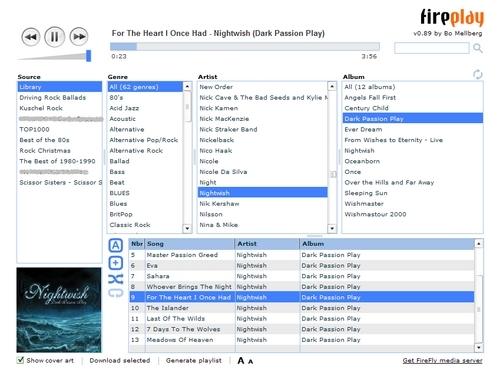 The player is called FirePlay. Now you will be able to start the http:/ /<ip-of-your-ds106-nas>:3689/FirePlay.html in your browser (also Wii browser). You just have to insert the login (admin) and the password (default is mt-daapd). The flash player is depicted on the picture below.